Porsche is bringing cars stretching as far back as 1900 to this year’s Festival of Speed, as well as its latest supercars – including the new 911 GT3 RS 4.0. Also on display will be racing cars from the company’s illustrious motorsport past. Starting at the beginning, Porsche will be exhibiting the 1900 Semper Vivus, the world’s first hybrid car. This machine was powered by the combination of wheel hub motors and a petrol engine. Back to more modern cars, Porsche will have the Cayenne, 911 GT3 RS 4.0 and the brutally powerful 620hp 911 GT2 RS. Additionally the public will be given its first chance to see the 550hp Panamera Turbo S.
The 917/30 Spyder, powered by a turbocharged 5.3-litre flat-12, will be displayed. 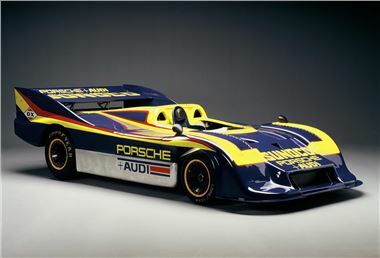 This car was so successful in 1970s American Can-Am racing that the rules were changed and it was excluded! A rally prepped 911 will make an appearances as will the 1986 961 racer and the 718 RSK Spyder. Finally, for those who wish to get really up close to a Porsche, professionals will be demonstrating the Cayenne to members of the public on a specially laid out course. The Festival takes place from 30 June – 3July.